Earn up to 15,600 reward points. 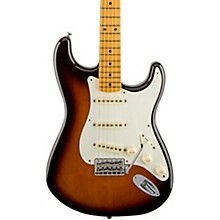 Based on a '57 Strat with a maple fretboard. 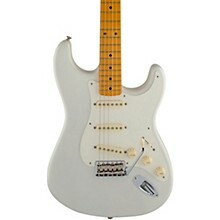 After years of painstaking research and design, the Fender Eric Johnson Stratocaster Electric Guitar has finally arrived. Designed with Eric by Custom Shop guru Michael Frank-Braun, this beauty is based on a '57, and combines the best of vintage design with modern electronics technology. The '57-style, 2-piece alder body has an ultrathin, Custom Shop-quality nitrocellulose lacquer finish that results in better resonance. Johnson opted for a one-piece, quartersawn maple neck with a 12" radius that's finished with a thin-skinned glossy lacquer and vintage tint. 19 prototype pickups were created before Johnson found the tone he was looking for. The Custom Shop-modified single coils use a new wire material and winding technique for the magnets giving them a unique, Eric Johnson-approved sound. Johnson and Braun also included one of Eric's most famous Strat modifications by wiring the tone controls to the neck and bridge pickups, instead of the standard neck/middle tone configuration of most Strats. 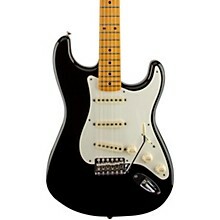 This guitar offers tonal perfection thanks to the discerning ear of one of the best players to ever pick up an axe. And it's pleasing to the eye as well, with its large arm contour, '57-style pickguard and shallow pickup cavities, plus thin headstock with vintage staggered tuners that eliminate the need for a string tree. Unbelievable Custom Shop-like quality in a production axe. Includes case.